The bracelet featured above is a DIY project of the greatest in creativity! I would never think of doing something like this and then have it turn out so beautifully. Run over there, NOW! Check out her pink door and all the decor she's created. She's a pro at dumpster diving, finding furniture just left on the street and reinventing the pieces. She's also a great fashion blogger! That IS a dynamite bracelet! I've checked in on Gwyneth here and there, but's it's been a while. Her posts are projects are always so cute! 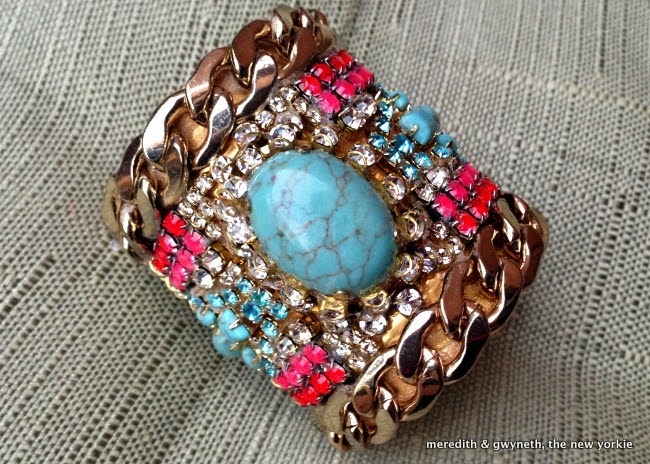 Gorgeous bracelet! Looks like I'll have to check it out! Oh how pretty, I would never think of that either. The bracelet is lovely. I will check it out. Good to "see" you! I wouldn't try this either, she's clearly so talented. Thanks for sharing this Pat I'll be sure to check it out too. I'm so happy whenever I see a post from you. I hope things are continuing to get better. Lovely bracelet...and it's so good to hear from you. I have thought of you often and wondered how you were doing. The blog will be here when you are ready. Don't rush. That is a gorgeous bracelet. I love how it all comes together. So very sweet of you to feature another blogger. I am not familiar with her blog, but I will def. head over and visit. Thanks for sharing the link. Love the bracelet! Glad to see you out and about, I have thought about you. Going to check out this blog. What a gorgeous bracelet and a lovely feature, dear friend. I will check out your friend's blog. It's lovely to hear from you! The bracelet is really pretty and you are in my thoughts!! Happy to see your post, Pat! The bracelet is beautiful! I love that bracelet. I dress really plain but I love some cool jewelry and shoes to step up my style. What a gorgeous bracelet - I've been by her site quite often actually - she's too adorable for words !!! That is one gorgeous piece. I will certainly check out the blog. It's good to see you posting, but as others have indicated, don't rush yourself. As for having something to say, it'll come, in time. Thinking of you and sending up a prayer that you have a peaceful week. Thank you so, so much for sharing our bracelet, Pat! You have put a huge smile on both our faces, and we are so lucky to have you as a reader! Thank you again!